Obviously you have a bathroom just for your kids right? That's a whole other room in your house you have to decorate. Just kidding. We live in a condo and we only have one bathroom. When we had our first child we had to figure out how to fit all of her stuff into our already complete bathroom. The biggest thing you're going to have to find space for is a bathtub (eventually toys too, but that is a topic for another day). 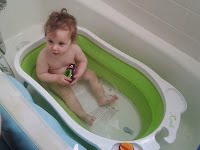 daughter in it until she was 2 without having to fill up our whole tub (saving water - woot). What about the competition? Below are my opinions about some of the other popular options out there and why we rejected them. 1. The Fisher-Price Whale of a Tub and The First Years Tub with Sling are the most popular tub choices out there. They do not fold. There was simply ZERO places for me to put this in my one and only bathroom other than the middle of the floor. Also, both of these have pictures of people bathing their kids in the kitchen sink. Who does this? Is anyone's kitchen sink clear enough for this? Mine sure never ever is. 2. The Puj Tub . This tub does fold but requires a very specific configuration of your bathroom sink where you have a very high faucet for the baby to fit under it (not me!). Alternatively, you can use your kitchen sink (again, ha! no). Also this will only work until your baby is 4-5 months old. At this point, if he or she is sitting reliably, then I guess you can fill up the big tub? Otherwise, I don't know what you do. We found the Skip Hop Dunks Stacking Bath Toys really helpful for washing our babies. You also want to get some wash clothes and hooded towels. As for soap, we like Baby Shampoo and Body Wash by MD Moms . You may also want a pad to kneel on for yourself if your knees tend to hurt. 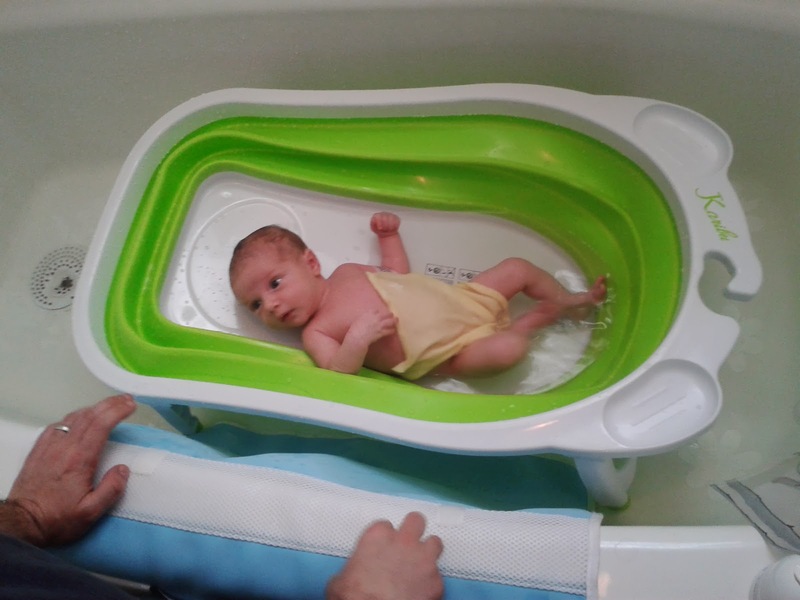 We actually have the Aquatopia Deluxe Safety Easy Bath Kneeler , but I can't exactly recommend it. When we got it, I didn't think about the fact that the part that hangs in the tub will constantly get wet because the tub is not just used for baby. This means we end up only taking it out when we're giving the kids a bath, so the organizational potential of it is completely wasted on us. Thus, if I had it to do over, I would almost certainly get the Skip Hop Moby Bath Kneeler instead.